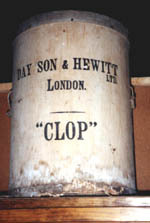 The letters CLOP stand for "cod liver oil powder" as well as imitating the sound of a horse's hoofs. This food supplement is still well known and used today and it contains many more ingredients than just cod liver oil. This and other "blood salts" were added to the feed of working horses by their men. Stories are still known of horsemen who would drill up through the floor of the hayloft which the farmer had locked up once he had doled out the feeds for the night. Then they were able to "tap" the stored oats for their own favourite horses. Some horses became over fresh on this extra corn, but the horsemen liked their animals to gleam with good health and be a credit to them. They would go out an hour earlier in the dawn to feed and clean them and plait their manes, even for ploughing. A carriage driving competitor once said that the cleanliness of modern driving carriages left a lot to be desired compared to the standards of the past: "My father wouldn't even have gone carting muck in the state some people go out on a marathon." It would need a big stable to use up such a barrel of CLOP: it's two feet tall! In 1794 Messrs Bailey and Culley surveyed Northumberland and Cumberland for the Board of Agriculture. In Northumberland: "The best draught horses used in this county are brought from Clydesdale, in Scotland; they are in general from 15 and a half to 16 hands high; strong, hardy, remarkable good and true pullers; a restive horse being rarely found among them." In Cumberland: "The horses are middle sized, from fourteen to fifteen and a half hands high, of various colours; but bays and chestnuts seem the most prevalent; for a small farm, where horses must answer for both draught and riding, they are probably most suitable; but certainly might be improved, by stallions from the North-Riding of Yorkshire, the best breed we know for the double purpose above-mentioned." In Westmorland, the 1794 survey was carried out by Anthony Pringle: "As there is but a small portion of the county under crop, the horses are not numerous, nor has any considerable attempt been made to improve the breed of these useful animals. They are small, not exceeding fourteen hands and a half in height, are said to be hardy, but they are neither strong nor handsome; sixteen or seventeen pounds are reckoned a good price for a horse at five years old. They are often turned out upon the commons in the intervals of labour, which, as the farmer very probably has neither turnips nor fallow, are very frequent in the summer months."